The chukar partridge (Alectoris chukar), is so named due it's distinctive call which sounds like "chuk." Native to locations in Asia such as the Himalayas and Nepal, it should come as no surprise that these little birds enjoy rugged terrain. 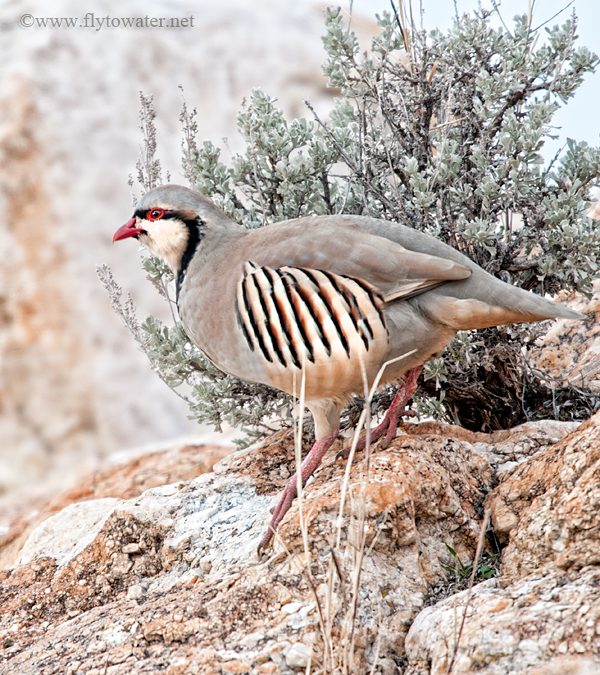 To describe the habitat chukars prefer as "steep" is to say that getting kicked in the gonads is bothersome. Somehow it doesn't adequately sum up the experience. Hunters and photographers of these partridge can also be identified by their calls, which happen to rhyme with "chuk." It has been said that a person hunts chukars for the first time out of curiosity, and thereafter for revenge. To me, no other game bird embodies the qualities of a survivalist quite like them. Living in the high desert foothills is a game of extremes. Water and food are scarce, and predators abound. The chukar is well suited to a harsh life, and is tremendously challenging to photograph. Infiltrating a covey with 20+ sets of keen eyes, each pair honed by daily existence as a prey animal, can be an exercise in futility. Add rocky, vertical geography to the mix and it's downright sporty. If those were the only considerations involved, life would be good. Unlike the hunter, the photographer also needs to make it all happen during ideal lighting conditions and be positioned on the sunny side of the bird as the opportune moment arrives. A truly complete image is rounded out by some supporting environmental elements within the frame, helping to add context to the scene. Some native grasses in the foreground, sage brush in the immediate background, and the ever-present rocks so common to a chukar's stomping grounds help complete the story.